In additional at least 20 countries and Pacific islands have issued tsunami alerts. Effected countries include Russia, Indonesia, Guatemala and state of Hawaii. The time of land fall can be estimated but size of the tsunami when it hits will be unknown as no telling how much it may dissipate as it travels across the Pacific Ocean. There is even a giant whirlpool off the coast. For Japan the crisis turns to rescue and recovery with shelter, food and water becoming an issue for people trapped by the water, mud and destruction. For the rest of the world, we hold are breath and wait to see what happens as countries in the tsunami's path are hit. Thoughts and prayers to the people of Japan. 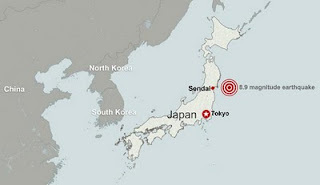 Below are links to live coverage of this tragic disaster along with a video of the tsunami as it swept across farmland taking homes, cars and more with it a path of destruction. Text REDCROSS to 90999 to give $10 today. For those in Canada: text REDCROSS to 30333.